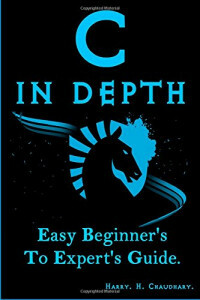 C in Depth :: Easy Beginner's To Expert's Guide. Essential C Skills-Made Easy–Without Fear! This C Programming book gives a good start and complete introduction for C Programming for Beginner’s. Learn the all basics and advanced features of C programming in no time from Bestselling Programming Author Harry. H. Chaudhary. This Book, starts with the basics; I promise this book will make you 100% expert level champion of C Programming. This book contains 1000+ Live C Program’s code examples, and 500+ Lab Exercise & 200+ Brain Wash Topic-wise Code book and 20+ Live software Development Project’s. All what you need ! Isn’t it ? Write powerful C programs…without becoming a technical expert! This book is the fastest way to get comfortable with C, one incredibly clear and easy step at a time. You’ll learn all the basics: how to organize programs, store and display data, work with variables, operators, I/O, pointers, arrays, functions, and much more. (See Below List)C programming has never been this simple! Who knew how simple C programming could be? This is today’s best beginner’s guide to writing C programs–and to learning skills you can use with practically any language. Its simple, practical instructions will help you start creating useful, reliable C code. This book covers common core syllabus for BCA, MCA, B.TECH, BS (CS), MS (CS), BSC-IT (CS), MSC-IT (CS), and Computer Science Professionals as well as for Hackers. This Book is very serious C Programming stuff: A complete introduction to C Language. You'll learn everything from the fundamentals to advanced topics. If you've read this book, you know what to expect a visually rich format designed for the way your brain works. If you haven't, you're in for a treat. You'll see why people say it's unlike any other C book you've ever read. Learning a new language is no easy. You might think the problem is your brain. It seems to have a mind of its own, a mind that doesn't always want to take in the dry, technical stuff you're forced to study. The fact is your brain craves novelty. It's constantly searching, scanning, waiting for something unusual to happen. After all, that's the way it was built to help you stay alive. It takes all the routine, ordinary, dull stuff and filters it to the background so it won't interfere with your brain's real work--recording things that matter. How does your brain know what matters? (D) 20+ Live software Development Project’s.